Royalty Software ~ DashBook for Book Royalties, Record Label Royalties, Publisher Royalties, & more! DashBook for Books, Music, and More. Run on your local PC (or Mac) or in the cloud. Version 7.2. Royalty accounting software for books, music, film, jewelry,.... You can now experience the best royalty management software at such a very low price with no monthly fees. Version 6 (v7 now here!) is now faster and has options for reserves, withholding, and batch emailing royalty reports, on top of the extensive core system that has been in use for years. Import sales, create invoices, track sales and royalties, and distribute reports with ease -- DashBook Royalty Pro does it all! Contact us to learn more and have your distributors and vendors added to our long list of existing sales imports (Amazon Kindle, iTunes, Ingram, The Orchard, etc.) so you never manually enter sales again. Schedule a meeting to talk to us. We will help you. If there is something that DashBook cannot do (unlikely), we can add it for you. We have videos on setting up DashBook for the music industry for your songwriters and artists (DashBook handles music publishers, labels and distributors, too), as well as showing how quickly you can setup DashBook for book publishers for your authors. Please view all our videos since the styles are similar and educational. But don't worry about all of the detail; we'll help you setup the system you need. DashBook – Do What You Love! Your business is not royalties accounting, and you shouldn't waste your time changing spreadsheets. Don’t let the tedious process of booking orders, tracking sales and calculating royalties get in the way of enjoying what you do. Our royalty accounting software is tailored to help you with book royalties and music publisher and record label royalties, and can do so much more. You will no longer need to keep up with changing music mechanical rates, as DashBook will do that for you. Keeping track of how much you need to pay in author royalties or artist, songwriter, or publisher song licenses will become easy. For as little as $499 you can have a powerful inventory & sales processing platform that automatically calculates royalties and enables worry-free reports and payment accounting at the click of a button. Designed for quick set-up and immediate benefit, DashBook is extremely easy to use royalty software by any member of your team. 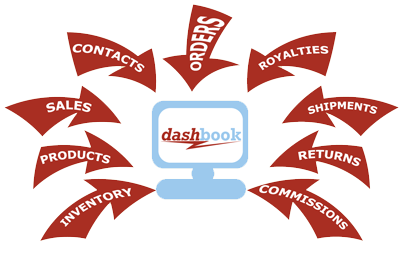 DashBook makes all of your sales tracking, inventory adjustments, commission allocations and complex royalties calculations a simple, rewarding process. Finally, an affordable royalty accounting software system designed and priced for the small to mid-size company, with the features, functions and dynamic reporting found elsewhere only in expensive, enterprise royalty software. Please see the PURCHASE page for the full price list of our royalty software offerings.